JANAKPURDHAM, Dec 17: Three days after the arrest of four persons including a District Administration Office (DAO) assistant "involved in forging citizenship certificates", police on Sunday arrested three more DAO officials for assisting the group. Last Friday, four persons including an assistant of Dhanusha DAO were booked for operating a fake office of the Chief District Officer (CDO), police said. Following the statement of the arrestees, police booked non-gazetted officer Bhulla Mandal and office assistants Birendra Chaudhary and Arun Yadav on Sunday. This incident had become mysterious as they had access to the "hologram stickers bearing the logo of Nepal government." 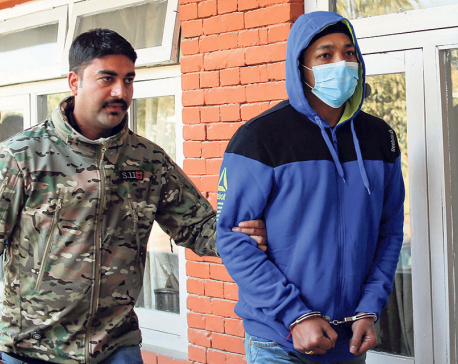 A team led by Deputy Superintendent of Police (DSP) Dipendra Shahi of the District Police Office (DPO) is investigating the case. CDO Pradip Raj Kandel is actively participating in the investigation. "Lack of coordination and co-operation between the government offices is very disappointing," said CDO Kandel during a press conference organized on Sunday, stressing "the authorities concerned must be serious regarding solving this problem." Speculating that there might be some other groups involved in a similar forgery of crucial government documents, CDO Kandel said, "In two days, four officials of DAO have been sent behind the bars. We just have to wait and watch to see who else is involved." He urged the chiefs of various government offices to be careful and aware about such irregularities. Earlier, police had arrested Roshan Kumar Chaudhary, 31, of Janakpurdham-20, Mahabir Mandal, 42, of Janakpurdham-4, Ganga Sah,49, of Aurahi Rural Municipality-5 of Dhanusha and Hemanta Kumar Pandey of Janakpur-4. Police confiscated around four dozen fake citizenship certificates issued in the names of various people from the rented room of Chaudhary near the DPO. Those certificates had the logo of DAO, Dhanusha, stamp of CDO, ward chiefs and many other government officials. Police also recovered some birth, death, migration and marriage certificates. Acting on a tip-off, police reached the site where this group was distributing citizenship certificates in a manner which was better managed than the process at the DAO. CDO Kandel has urged the police to arrest everyone involved in this crime including the people attaining fake citizenship certificates.